Father’s Day is tomorrow, and for some reason, this song always makes me think of my dad. It’s fun and lighthearted, but it has a message, just like my old man. Maybe it’s just the time frame during which this song was popular that makes me remember sitting on my dad’s lap watching the Tigers play (and in those days, they played well!). Maybe it has something to do with the fact that Bob Seger is a Michigan institution. Maybe it’s just one of those subconscious connections that I’ll never fully understand, but makes me happy nonetheless. I only wish that I could celebrate my husband this Father’s Day; with some doing however, I have a good feeling that next year will be a much bigger cause for celebration for our little family. Wherever you are, however you celebrate, and whatever your relationship with your own father or kids, I hope you have a splendid Father’s Day weekend. I hope next Father’s Day is a whole new experience for you. Good luck. Hi from a fellow Michigan blogger! I hear you about Bob Seger – he reminds me of my father-in-law. Probably because not only is he a big fan, but he met him once on a plane and it was apparently a proud moment for him. Sorry to hear about the early ovulation this cycle – I do hope that the one “encounter” was enough. I’ve had my share of slightly-off cycles too, and I know how frustrating it can be. Best of luck, and happy ICLW! Hi Tracy. I’m Tracey, here from ICLW #118. 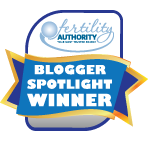 I’m an IVF survivor with 2 miracles and I blog for my RE to “give back” to those still on their journeys. I wish you luck and hope your encounter worked. If you’re interested, we’re having a contest in honor of Father’s Day thats free fun and easy with some cool prizes and a grand prize of a free micro_IVF cycle if you or anyone you know is interested. I am trying to spread the word to help others. I so hope you won’t need it though and I’ll check back to see! Hope you spend the next year with a child of your own! I am so glad the song brings back happy memories for you. Hope you are able to dance like crazy next year!